Located in Venice (Castello), Venice Life is within a 15-minute walk of St. Mark's Basilica and Bridge of Sighs. The front desk is staffed during limited hours. Located in Chioggia, Campingvillaggio Atlanta e Mediterraneo - Campground is a 3-minute drive from Beach of Sottomarina and 6 minutes from Astoria Village. Free self parking is available onsite. With a stay at Hotel Albatros in Jesolo, you'll be within a 5-minute drive of Sea Life Jesolo and Piazza Drago. The front desk is staffed during limited hours. Free self parking is available onsite. 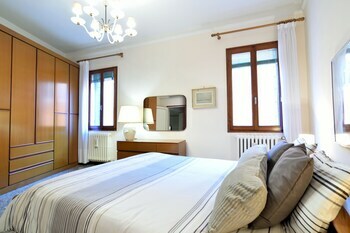 When you stay at Hotel Trotter in Leno, you'll be 8 minutes by car from S. Maria Assunta Dietro Church. The front desk is staffed during limited hours. Free self parking is available onsite. With a stay at Bellaria Relais in Piano di Sorrento, you'll be within a 15-minute drive of Piazza Tasso and Marina Longa of Tordigliano. Free self parking is available onsite.